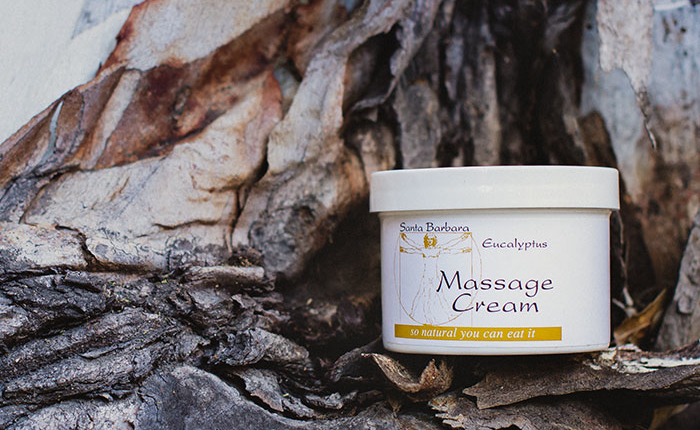 Santa Barbara Massage Cream was created to fill the need for an all natural lubricant. It has all the benefits of olive oil mixed with the healing properties of essential oils. It was specifically made for deep tissue styles of massage. Santa Barbara Massage Cream offers a nice resistance that allows the therapist to penetrate deeply into the tissues, and its smooth and luxurious feel makes it perfect for lighter Swedish styles. Clients don’t leave the session feeling oily, because only a small amount of cream is needed. A revolution in massage cream! Free shipping in U.S.A with a $100 purchase. INTERNATIONAL ORDERS: Please contact us directly for shipping rates. WHOLESALE PRICING AVAILABLE: Contact us directly. LAVENDER (Balancing) Soothing and calming. Slows wrinkles and helps prevent scarring. Relieves muscle pain and headaches. EUCALYPTUS (Stimulating) Invigorating & refreshing. Helps to throw off fatigue and tension. YLANG YLANG/ ORANGE (Sedating) Counters depression, anger & fear, is a strong sedative. Good for problem skin. CLARY SAGE / LAVENDER (Rejuvenating) Eases muscle & nervous tension, good for mental fatigue. Promotes smiles. Our massage cream is like nothing you have ever tried. Its thick consistency and slight resistance create a luxurious feel during the massage. Because it contains no water or alcohol that evaporates, a little lasts a long time, and maintains a wonderful glide. Because most massage creams include water (which is why they are white), they require preservatives. Many of these preservatives are hormone disruptors. Although these are safe for clients who are only exposed during the session, having your arms covered in cream all day long during every session can cause health problems for massage therapists. Check your cream and if it contains iodopropynul Butylcarbamate, Triethanolamine, or Phenoxyethanol- consider switching. Why use a massage cream that can hurt you? 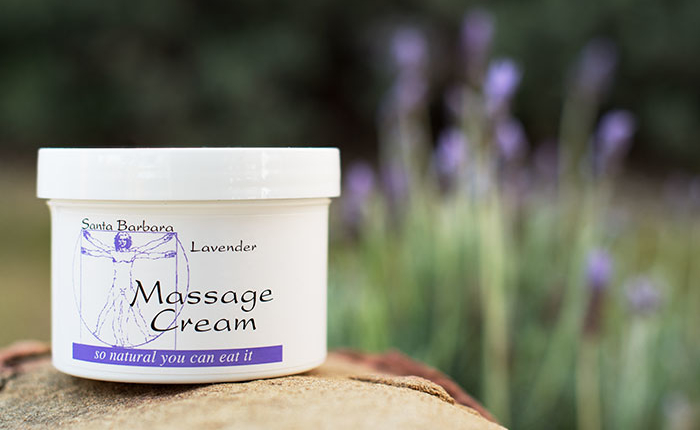 Santa Barbara Massage Cream has ingredients that you can eat, and has an incredible glide. OLIVE OIL – Used by the ancient Greeks because of its healing properties and effects on the skin. The olive tree was imported from Greece over 2500 years ago. It has been considered a symbol of peace, goodness and purity. The ancient Greeks stockpiled olive oil for economic security because of its long shelf life. Superstitious folk in medieval times used it to drive out evil spirits. Thick, luxurious and delicious, olive oil is not only good nutritionally, it is also a wonderful beauty secret for dry skin. A few drops massaged onto the face at night is great for deep moisturizing, as it absorbs into the skin beautifully. 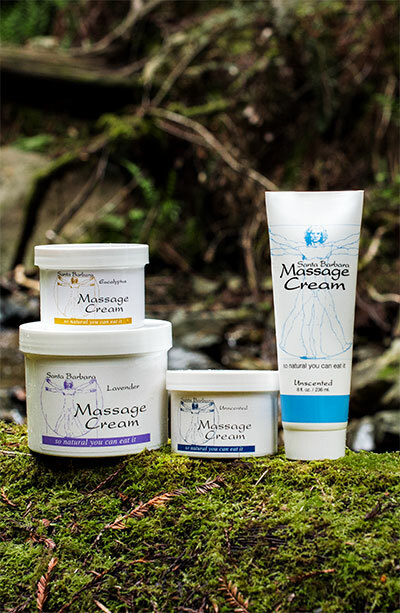 When added to massage cream, each massage becomes a healing session. COCONUT OIL- Our cold pressed coconut oil gives our massage cream an excellent glide while maintaining a good resistance for deeper work. It comes from the meat of the coconut and is rich with lauric acid. Laurie acid has antiviral and antibacterial properties. High-grade virgin coconut oil has a very long shelf life because of its natural anti-oxidant properties. It’s wonderful as a digestive aid, has been known to be a powerful agent in destroying intestinal parasites. Recently, studies have shown this oil to be one of the healthiest substances to use on the skin – that it actually increases the metabolism, which helps to lose weight. This is why we use it in our massage cream. BEES WAX – Turns our massage cream into a solid when it is in the jar. Bees wax makes it so you only have to use a little. Clients do not end the session feeling oily. It is the simple bi-product of a honeybee. Bees wax is the key ingredients in the most highly regarded natural skin products. It makes a wonderful skin softening balm, with a lovely texture and feel. Most people think the most important substance created from the honeybee is honey, but actually honeybees primary job is pollination and without these vital workers, our crops would not flourish. In Medieval times, beeswax was quite valuable not only as a quality candle wax, but as a bartering commodity. ESSENTIAL OILS are volatile oils. They are distilled or “extracted” from the tissue of plants by a process of evaporation and collection of the condensed liquid. The word “essential” means absolutely necessary. The word “essence” comes from the Latin word, esse, meaning “to be” or “existence.” Some synonyms for essence are: spirit, lifeblood, heart, soul, inwardness, substance, and core. It could be said then, that the essential oil of clary sage is the spirit of the clary sage plant. Although the word aromatherapy implies that the aroma is what does the healing, it is actually the essence of the oil that contains the healing properties. Not only does the essential oil that we add to our massage cream smell good, but each of the oils do have healing properties. CLARY SAGE that is added to our massage cream has an earthy, nutty scent that is balancing, grounding and soothing. It has properties similar to estrogen and is often used to regulate periods, relieve tension and balance hormones. The ancient Greeks and Romans used it for its euphoric effects as an aphrodisiac. Modern aromatherapist’s recommend it for peri-menopausal women whose libido’s have ebbed, and it has been known to be useful in treating acne, softening wrinkles, and helping to control cellulite. Clary sage should not be used by people with epilepsy, breast, uterine or ovarian cysts; or during pregnancy. LAVENDER oil in our massage cream is one of the most widely used, all-around oils on the market today as a fragrance and for medicinal purposes. Unlike other oils, it can be applied directly on the skin. It’s wonderful for relieving headaches and stress, promoting restful sleep, and even lowering high blood pressure. It is used in many massage creams, including Santa Barbara Massage Cream. It can be used as an anti-inflammatory for joint problems, or as an antibiotic for bites, stings and cuts. It is great for wrinkles and acne. Two to three drops added to a facial steamer 15 minutes a day will help clear up unpredictable breakouts and prevent scarring. SWEET ORANGE oil in our massage cream is extracted from the fresh peel of the fruit of the orange tree by a method of cold pressing. At one time the orange tree was rare and found only in China and India. It has since been imported to a wide variety of warm, sunny climates. The aroma is as sweet, soothing and refreshing as the fruit itself. It has been used to stimulate the digestive system, as a mild laxative, and as an antiseptic. Sweet orange has been known for mollifying hopelessness, addiction tendencies and to promote a feeling of happiness. YLANG YLANG is a native plant grown in the tropical climates of Indonesia, the Philippines and Brazil. The flowers are steam-distilled to create the oil. The aroma is seductive and sedating, especially when blended with sweet orange. It has anti-depressant qualities. It has been used since for ages as an aphrodisiac and has often been known to help when dealing with anger, anxiety, guilt, and resentment. Its medicinal uses range from treating malaria, relieving insect bites, and healing infections. It has powerful antiseptic properties. Some metaphysical terms associated with ylang ylang are: euphoric union, opportunity and peace. EUCALYPTUS oil in our massage cream comes from the silver, blue-green leaves of one of the tallest trees in the world. It is said that the Aborigines used the oil as one of their primary medicinal treatments. It has been used in modern times for its antiseptic and anti-inflammatory properties. Many find relief from skin irritations (hence it’s use in massage cream), sinus problems, colds and flu symptoms. It also helps reduce fever and is a powerful diuretic. The metaphysical phrase associated with eucalyptus oil is “room to breathe.” It is one of the few essential oils that may be applied directly to the skin, but only in diluted form and not on babies. It is a great scent for massage cream. 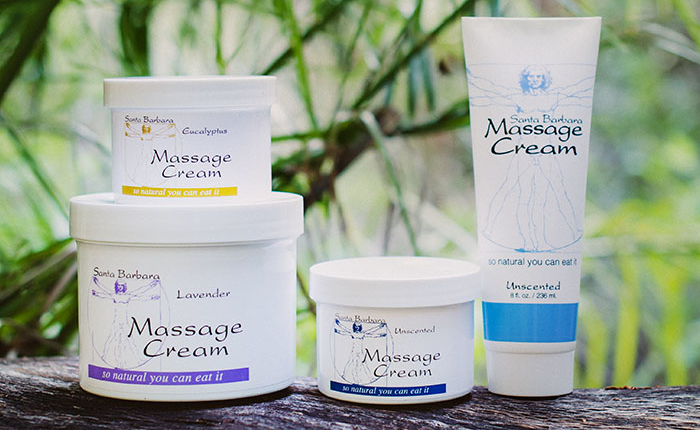 We initially created this cream to use in our Deep Tissue and Neuromuscular Therapy classes. We wanted a truly natural cream with a good resistance for deep work, and smooth glide for relaxation work. We spend long hours of the day with cream covering our forearms. We don’t want any chemicals seeping into our bloodstream. Simpler is better- and safer for us as therapists. Because it is thick, this cream will never spill on a client’s expensive rug. Have you ever applied tons of liquid oil on a pair of hairy legs- trying to get some glide? Just a little SB Massage Cream creates a great glide on hairy legs. By using so little- people don’t end up feeling oily after the massage. My wife and I discovered that our cream is great for removing tar from our feet after long beach walks. Yahoo! The biggest mistake people make in using our cream- they use too much. Each 8 oz. jar should last for 16-20 full body massages.